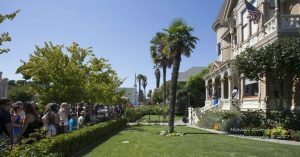 What a fantastic year for Napa County Landmarks! We started the year out with the approval of three National Register nominations by the State Historical Resources Commission, several successful walking tours, two historic bike tours in Calistoga, a golf fundraising event, the new Bothe Park Vintage Trailer Hitchup, and our most recent event: the Award of Merit. Special thanks to Napa Valley Museum and Elhers Estate for helping sponsor the event.